Great breakfast, awesome location, very clean great staff. The best place ever if you prefer a quiet and relaxing rest on a sandy beach! Ideal choice for those who want to escape noisy city life. 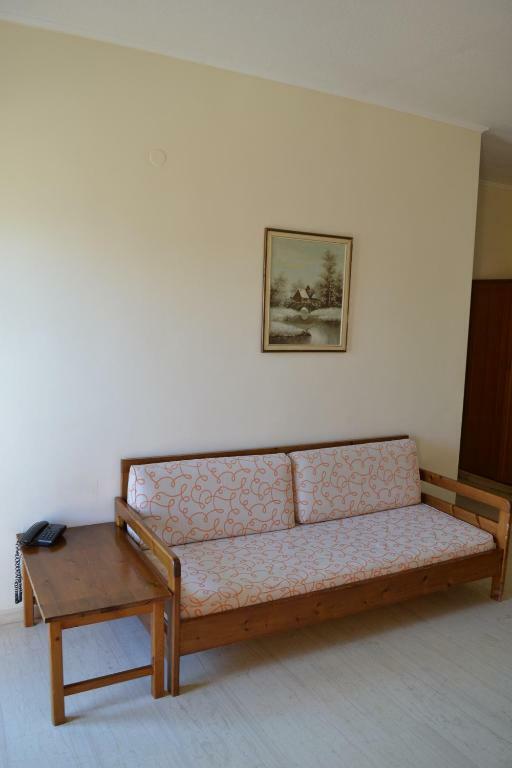 You will find here an extremely helpful staff, nice breakfast (both English and continental), outdoor pools, clean rooms, a next-door restaurant with really fine and rich Greek cuisine and drinks, and just few steps to a bus stop to/from Chania (a bus comes every 15 min, and a way takes near 20 min). Delicious breakfast buffet with a good variety. Amazing room view to the sea! Overall it’s a very nice stay close to the beach, bars, restaurants in the tranquil community of Stalos. Marios & his staff do an amazing to make everyone’s stay pleasant. Location of the property was excellent, it had beach nearby, 2 pools and outdoor bar/cafe. Everything was very clean and well looked after, staff in the cafe as well as the apartments were amazing Cleaners are the best we have seen, very helpful and cleaned daily! The place is a little gem. Alright it needs renovations. Paintwork, shower edging, new curtains, brightening up a bit etc but it's clean, spotless, the staff are friendly, the little beach front restaurant serves good breakfast and food for the rest of the day. Would certainly come back. One bedroom apartment was bright, clean and spacious. Right on the beach, walk 5 yards from breakfast and you are there. The beach is very long, great for a good walk. Parking across the road and some shops nearby. 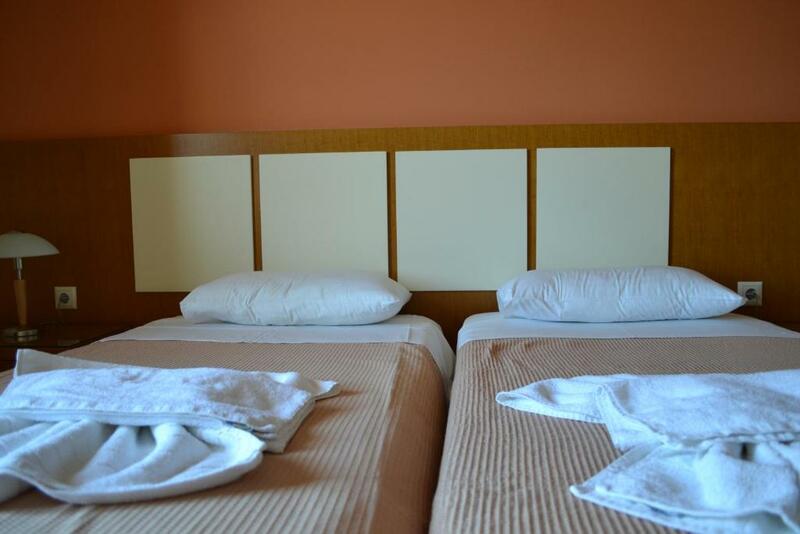 The rooms where very clean, the beds where so comfortable, i would highly recommend staying here & we hope to return again. the breakfast was lovely the staff where very nice the breakfast staff where amazing. The View from room 208 was fantastic. The room was cleaned 6 days in a week, which is more than we espected. The hotel is very close to Chania. Free sunbeds is a fine service. The beach is sandy. 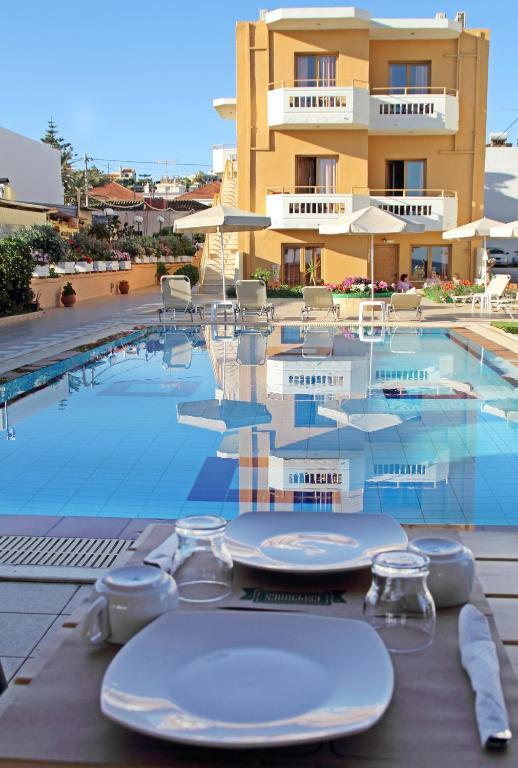 Lock in a great price for Esperides Hotel Apartments – rated 9.3 by recent guests! Esperides Hotel Apartments This rating is a reflection of how the property compares to the industry standard when it comes to price, facilities and services available. It's based on a self-evaluation by the property. Use this rating to help choose your stay! 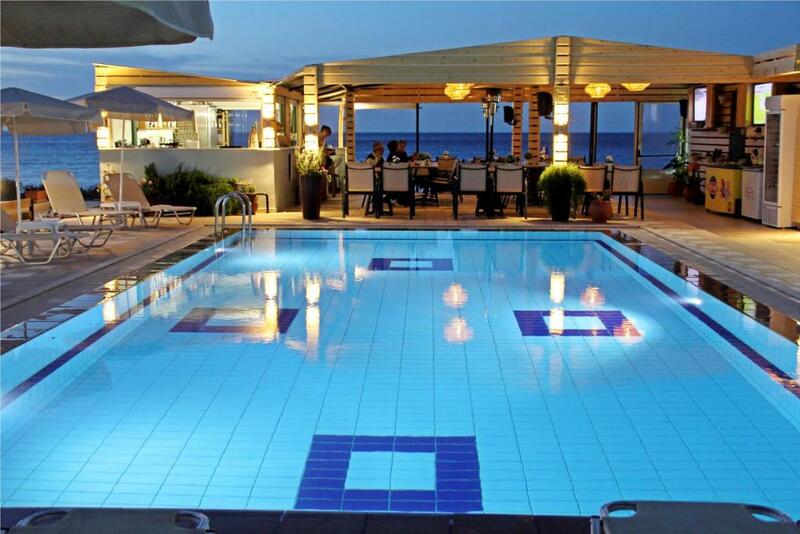 Offering an outdoor swimming pool, Esperides Hotel Apartments is located on the beach of Kato Stalos in Crete. It includes a garden, sun terrace and snack bar. 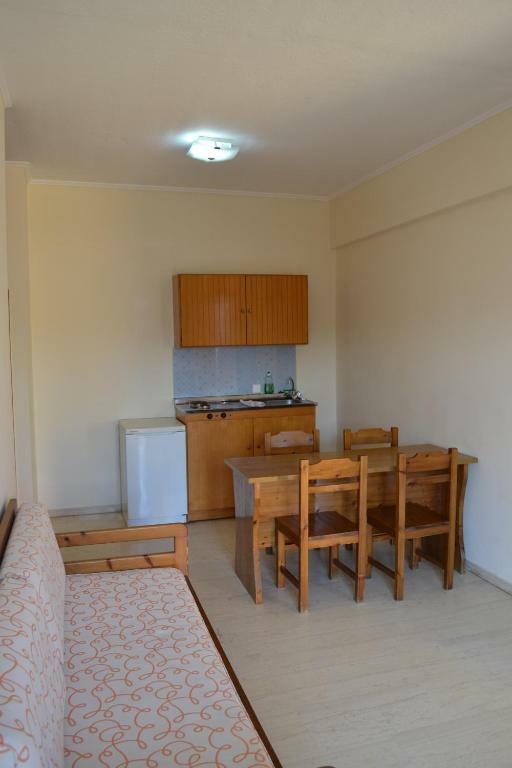 Each air-conditioned apartment features free Wi-Fi, a TV with satellite channels and a seating area. The kitchenette includes a fridge and coffee machine. The bathroom comes with a bath or shower and a hairdryer. Guests can relax at the snack bar or on the sun loungers offered by the pool. Alternatively, they can visit the city of Chania with the The Archaeological Museum. 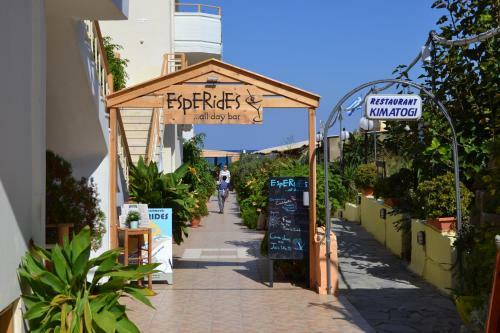 Esperides Hotel Apartment is 12 mi from Chania International Airport. The property offers free parking on site. This property also has one of the top-rated locations in Stalos! Guests are happier about it compared to other properties in the area. This property is also rated for the best value in Stalos! Guests are getting more for their money when compared to other properties in this city. When would you like to stay at Esperides Hotel Apartments? Offering a balcony overlooking the sea, this air-conditioned studio includes free Wi-Fi, a TV with satellite channels and a seating area. The kitchenette features a fridge and coffee machine. The bathroom comes with a bath or shower and a hairdryer. Offering side sea view, the air-conditioned apartment features free Wi-Fi, a TV with satellite channels and a seating area. The kitchenette includes a fridge and coffee machine. The bathroom comes with a bath or shower and a hairdryer. 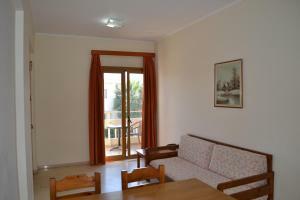 The air-conditioned apartment includes free Wi-Fi, a TV with satellite channels and a seating area. The kitchenette features a fridge and coffee machine. The bathroom comes with a bath or shower and a hairdryer. This studio features a balcony with garden views, seating area and air conditioning. This apartment has a balcony with garden views, seating area and kitchenette. The living room can accommodate up to 2 guests. This apartment has a fireplace and kitchenette with coffee machine. This studio has a balcony, kitchenware and sofa. Our hotel was founded in 1988 and the first costumers came in at the summer 1989, previous at the site was the house of thw owners were they have opened and lived. All these years the hotel is running by our family and we try to make your stay as comfortable we can and have the most relaxing vacations you can have. Chania is a perfect destination for all people for all over the world, it combines the mountain with the exotic beaches in a very sort distance. The most beloved places in Chania that we have also visited and we highly recommend to our costumers is the Samaria gorge, Falassarna beach, Elafonisi beach, Palaiochora, the old harbour and the old city of Chania that is 600 years old..
Our neighbourhood is not so busy but you can find anything you want in a very close distance like supermarkets, breakfast is served at the snack bar of our hotel and the bus stop is 100 meters far from the hotel and atm is next to bus stop. House Rules Esperides Hotel Apartments takes special requests – add in the next step! Esperides Hotel Apartments accepts these cards and reserves the right to temporarily hold an amount prior to arrival. The surrounding area was quiet when we were there, but Chania is a very short drive away and it was lovely. There was no oven or microwave, hasd we being staying longer than four days this is something we would have looked for. There were a lot of cats in the restaurant, where also the cat food was placed . This has to be written in the hotel description. There was everything what we needed in the apartment. We really appreciate how they cared about guests. The food in Esperides restaurant is delicious. Little difficult to find, need a bigger sign for parking. Very lovely location next to beach, amazing sea view from room, great food in the restaurant and good service all over. Lovely comfortable bed. Everything was really clean. Right on the beach. We should have stayed longer in Chania!! The place was great - very near the beach, bus station is less than 5 min walking distance (buses can bring you to Chania Old Town in 15-20 mins), and the staff were very friendly! We requested help to get to Elafonisi Beach (which is highly recommended to visit!!) straight from the Chania Bus Station as we only have 1 night in Chania and Marios willingly helped us. We had issues on the communications but that has been sorted out eventually. I can say this place is a definite value for money. Delicious breakfasts, fantastic views and always smiling staff are the basis of a well-started day, and that's the day you can have at the Esperides Hotel every day!! Marios, your drinks are perfect! I give 100 points for Pinacolada! :) The children (3 and 9 years old) were delighted with the pool and the paddling pool, and the evenings on the beach further encourage us to return to Esperides. Access from the hotel to any place of the western Crete is ideal, very close to a few supermarkets and restaurants. A great place for a holiday with children, especially if the aim is not only to lie on a deckchair :) We spent the best week there on Crete! Very helpful owner and staff, the room was simple but clean, breakfast was fresh and tasty. Definitely worth more than two stars.